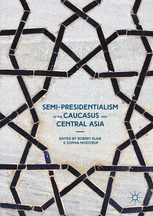 Sophia Moestrup and I have edited a new volume called Semi-Presidentialism in the Caucasus and Central Asia. It is published by Palgrave Macmillan. The book contains two chapters by Sophia and I. In the Introductory chapter we describe constitutional variation across the region and outline the basic research questions of the book: do institutions matter in post-Soviet countries? If so, do they matter for democratic performance? Whatever the answer, has the organization of the executive and executive-legislative relations had an impact on political life? In the Concluding chapter, ‘Weaker Presidents, Better Semi-Presidentialism’, we present a single policy recommendation: countries should adopt a constitution with a relatively weak presidency. All else equal, weak presidential institutions are likely to be more beneficial than super-presidencies. We argue that these benefits derive both from the intrinsic institutional incentives associated with such a system as well as the creation of environment in which the choice of a weak presidency is seen as being an attractive constitutional choice. The book also contains a scene-setting chapter by Alex Baturo. This chapter provides an overview of similarities and differences between the political regimes that emerged in post-Soviet Eurasia, showing how “patronal” first secretaries under the Soviet Union became “patronal” presidents of their own nation-states after independence. There are also four country case study chapters on semi-presidentiaism in Armenia, Azerbaijan, Georgia, and Kyrgyzstan, as a well as a fifth case study of presidential Kazakhstan. These chapters look at the reasons for institutional choice in these countries, including Kazakhstan’s brief flirtation with semi-presidentialism in the early 1990s, as well as an assessment of the constitutional powers of the presidents in all of these countries, and an analysis of the reality of vertical power and political pluralism (or its absence) in practice. More details can be found at the Palgrave website. Indeed, there are more details still, including chapter abstracts, from the Springer website. This entry was posted in Armenia, Azerbaijan, Georgia, Kazakhstan, Kyrgyzstan, Russia and tagged Caucasus, Central Asia, semi-presidentialism on 20 May, 2016 by Robert Elgie. In Azerbaijan a legislative election was held on Sunday. The only definite figure seems to be the turnout, which, officially, was 50.14%. The names of the deputies returned have been announced. However, the vote share for the different parties is not yet available. I do not know what electoral system is being used, but presumably it is a plurality system. Eight deputies were elected with less than 50% of the vote. One deputy was elected with 34.52% of the vote, which suggests at least one closely fought contest. There is a, somewhat partisan, report that the ruling New Azerbaijan Party (Yeni Azərbaycan Partiyası – YAP) party and its allies have won 90% of the seats and that friendly allies have taken the remainder of the seats. There is a preliminary OSCE observation report here. This entry was posted in Azerbaijan on 12 November, 2010 by Robert Elgie. The parliamentary election was held in Nagorno-Karabakh on 24 May. This region is officially part of Azerbaijan, but it has a substantial Armenian population and declared independence after the collapse of the Soviet Union. The enclave is not recognised internationally, but has a high degree of independence from Azerbaijan. In a previous post, I outlined the semi-presidential elements of the 2006 constitution. In Armenian, Nagorno-Karabakh is known as Artsakh. This result marks a shift of votes and seats to the “Free Motherland” Party, though the Prime Minister, Arayik Harutyunyan, is from this party already. Wikipedia reports that he was elected to this position in September 2007 with the support of all 32 deputies. This entry was posted in Armenia, Azerbaijan, Nagorno-Karabakh on 31 May, 2010 by Robert Elgie. In Azerbaijan municipal elections were held on 23 December. The results have just been disclosed by the Central Election Commission. These elections have been difficult to follow. I can find no disclosure of any vote share, though this may emerge later. If so, I will update this post. The turnout was officially reported as 32%. Anyway, there is now some detail about those elected. An Azeri news site reports that President Aliyev’s Yeni Azerbaijan party (YAP) won 10,431 seats of the 15,591 up for election in 1,718 municipalities. Independent candidates, some of whom, presumably, are allied with the YAP, won 4,157 seats. The same site reports that “candidates from 17 other political parties filled the remaining seats”. This entry was posted in Azerbaijan on 18 January, 2010 by Robert Elgie. Unsurprisingly, voters in Azerbaijan ratified the proposed amendments to the Constitution in a referendum last week. The most internationally controversial reform was the one that abolished presidential term limits. Voters were asked to decide on 29 amendments to the Constitution. All of the amendments were passed with a vote of around 90% in favour. The text of the 1995 Constitution (as amended in 2002) is available here. The details of the 2009 constitutional amendments and the votes for each one is available here. Azerbaijan has been classed as Not Free by Freedom House since 2003. It has had a Polity score of -7 since 1998. This entry was posted in Azerbaijan on 22 March, 2009 by Robert Elgie. RFE/RL reports that the parliament of Azerbaijan has voted 100 to 7 to hold a referendum on 18 March. The referendum will propose the abolition of presidential term limits. It is inconceivable that the referendum will fail. On 24 December the Constitutional Court ruled that such a referendum was not unconstitutional. This decision effectively eliminated the last obstacle to the end of presidential term limits. This entry was posted in Azerbaijan on 5 January, 2009 by Robert Elgie. RFE/RL reports that the ruling YAP party in Azerbaijan has called for an end to the two-term presidential limit. In October President Ilham Aliyev was re-elected with 88.7 per cent of the vote. As things stand, he is not eligible for re-election in 2013. However, RFE/RL reports that 95 of 99 parliamentarians have “asked the Constitutional Court to consider a referendum that would allow unlimited presidential term limits”. In an autocracy like Azerbaijan, it is difficult to imagine that such a polite request will be denied. I have a colleague who has worked on the issue of when autocrats leave and do not leave power. This year in semi-presidential countries alone, we have seen term limits abolished in both Algeria and Cameroon. Azerbaijan now looks set to follow suit and my colleague will have another observation for his data set – I’m not sure if it will be a 0 or a 1! This entry was posted in Azerbaijan on 22 December, 2008 by Robert Elgie. President Aliyev has been reelected. The election was not considered to be free or fair. The preliminary OSCE report on the election is available here and it gives some nice details of the ‘campaign’. This entry was posted in Azerbaijan on 20 October, 2008 by Robert Elgie. This is the first of an occasional series on semi-presidentialism in areas other than internationally recognised states. I am focusing on areas that have full constitutions. However, these areas are not recognised by the international community as independent states. They may be territories that have declared independence but whose status has not been internationally recognised or they may simply be self-governing units under the protection of another state – territories like Greenland, or the Isle of Man. The first example is Nagorno-Karabakh. This region is officially part of Azerbaijan. It has a substantial Armenian population. After the collapse of the Soviet Union the Nagorno-Karabakh legislature declared independence. However, this was not recognised by either Azerbaijan or the international community. There has been ongoing conflict between Azerbaijan and Armenia over this region since this time and indeed well before. The Nagorno-Karabakh Republic has a high degree of de facto independence. In December 2006 a referendum was held that approved a constitution for the territory. The result of the vote was not internationally recognised. However, given the area enjoys a degree of de facto autonomy, political leaders within the area have declared it to be the basic constitutional document governing the area. The text is available here. (Prior to the referendum my understanding is that the territory used a series of laws to govern its internal affairs and that there was no consolidated constitutional document). 1. The President of the Republic shall be elected by the citizens of the Nagorno Karabakh Republic for a five-year term of office. Article 99 3. The Government shall be composed of the Prime Minister, Deputy Prime Minister, and the Ministers. 1. The National Assembly may adopt by a majority vote of no confidence towards the Government. However, it is not entirely clear what happens if a vote of no-confidence is passed. There is also a quite complicated role for the legislature in the appointment of the prime minister and government (Article 100). The most recent presidential election was in July 2007. The winner was Bako Sahakyan, who ran as an independent and who won over 85% of the vote. The last legislative election was held in June 2005. I believe the government is a coalition of the Democratic Party of Artsakh and the Free Motherland party. The opposition appears to have only 3 seats in the 32-seat legislature. Armenia and Azerbaijan are, of course, themselves semi-presidential. This entry was posted in Armenia, Azerbaijan, List of disputed areas and other territories with semi-presidential constitutions, Nagorno-Karabakh on 4 June, 2008 by Robert Elgie. Semi-presidentialism in the FSU – When did it begin? The Former Soviet Union (FSU) is the home of a number of semi-presidential countries. In terms of their current constitutions, there are some unequivocal cases of semi-presidentialism: Armenia, Azerbaijan, Belarus, Georgia, Kazakhstan, Kyrgyzstan, Lithuania, Russia and Ukraine. Previously, Moldova was unequivocally semi-presidential too. The situation in Tajikistan and Uzbekistan is a little more ambiguous. In both cases, parliament ratifies the president’s decrees that appoint and dismiss the prime minister. It is debatable as to whether this is sufficient to constitute a semi-presidential constitution. The level of responsibility to parliament is low and, in any case, responsibility is only individual and not collective. Sticking to the unequivocal cases, the question is when do we date the start of semi-presidentialism? In the case of Georgia, the answer is easy. As per a previous post, it became semi-presidential in 2004 after a constitutional amendment. For the other countries, the dates of the first independence constitutions are as follows: Armenia (1995), Azerbaijan (1995), Belarus (1994), Kazakhstan (1993), Kyrgyzstan (1993), Lithuania (1992), Moldova (1994), Russia (1993) and Ukraine (1996). All the same, I think we have to be a little careful as to when we date the beginning of semi-presidentialism and for two reasons. Firstly, I am not sure that there are consolidated constitutional documents prior to the passage of the first constitutions. Certainly, I have been unable to find them. If they do exist, then please let me know where to get hold of them. In the absence of a consolidated document, it is to difficult to verify the start date of semi-presidentialism. Secondly, even if there were consolidated documents, would they indicate semi-presidentialism? According to the 1978 constitutions of the socialist republics of the USSR, it is certainly the case that the Council of Ministers was responsible to the parliament (Supreme Soviet) and that there was a person who occupied the position of Chairman of the Council of Ministers. Moreover, prime ministers certainly existed in the newly independent countries from an early point: Armenia (1990), Azerbaijan (1991), Kazakhstan (1991), Kyrgyzstan (1991), Moldova (1990), Russia (1991) and Ukraine (1990). Again, though, in the absence of consolidated documents, it is difficult to verify the specific start date of semi-presidentialismism. Were there other amendments to the constitution apart from just the direct election of the president? Were there changes to the status of the prime minister and cabinet? And so on. The precise start date of semi-presidentialism can be important because a couple of these countries experienced a brief period of democracy but then collapsed. For example, according to Freedom House Azerbaijan was a partial democracy in 1991 and 1992, but collapsed in 1993. The same is true for Kazakhstan from 1991-93 before its collapse in 1994. Studies about the positive or negative effects of semi-presidentialism on partial democracies do not have a large number of cases to go on. Therefore, the decision about whether or not to include two collapses is potentially important. If anyone has any comments, then please let me know. This entry was posted in Armenia, Azerbaijan, Belarus, General constitutional issues, Georgia, Kazakhstan, Kyrgyzstan, Lithuania, Russia, Ukraine on 22 May, 2008 by Robert Elgie.